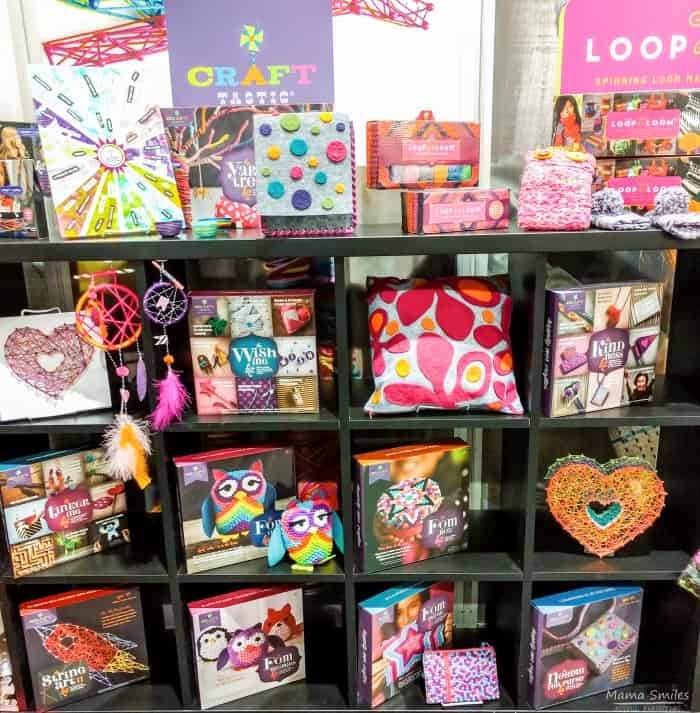 I spent hours scouring the trade show floor at Creativation 2017 in search of the very best craft supplies and craft kits. 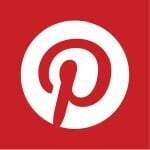 Here are my top finds – lots of great stuff here! 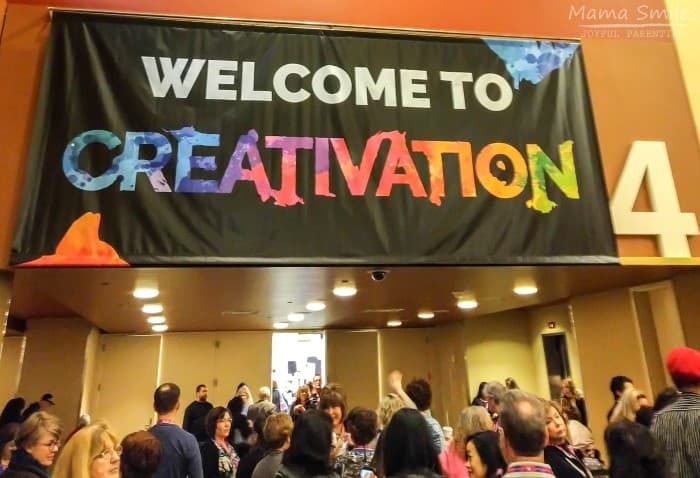 Last month, I traveled to Creativation, the annual trade show hosted by the Association for Creative Industries. 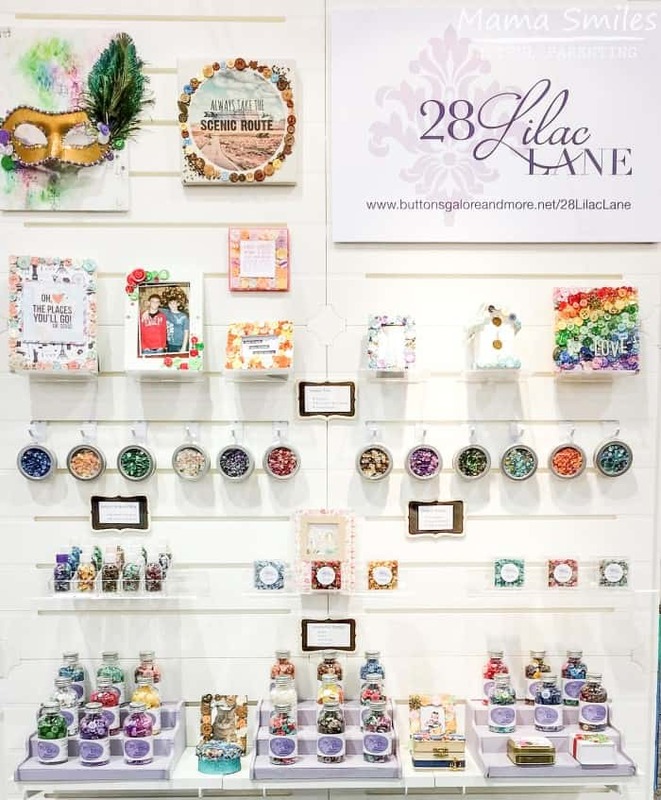 I went there in looking for very best craft supplies, craft techniques, and craft kits to feature here on my blog. Here are a few favorites from the show floor. 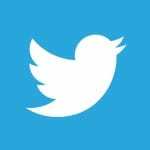 I’ll be featuring other companies in creative posts throughout the year. There are a few products that I LOVED that I am not writing about yet because they aren’t widely available, or they are still in testing phase. Hopefully I can share them later. CES 2017 was a MONSTER trade show. Creativation is much smaller, but also much more enjoyable from an aesthetic point of view. The trade show floor is covered by all sorts of amazing creations. 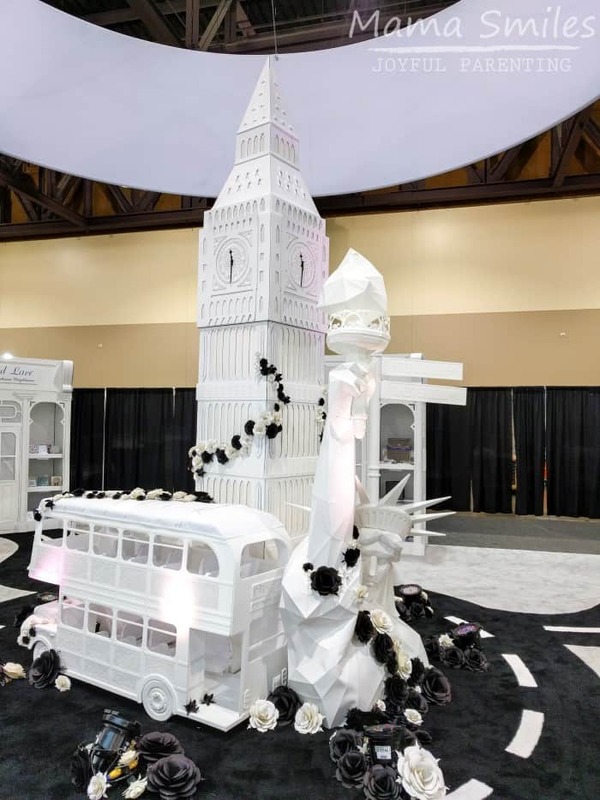 This scene of world landmarks made entirely out of paper was my personal favorite. The show booths are gorgeous as well. My personal favorite was this display from Buttons Galore & More. I was surprised to see this typewriter on display! We had a computer by the time I was old enough to type, but I do remember my parents using one – and grandparents. 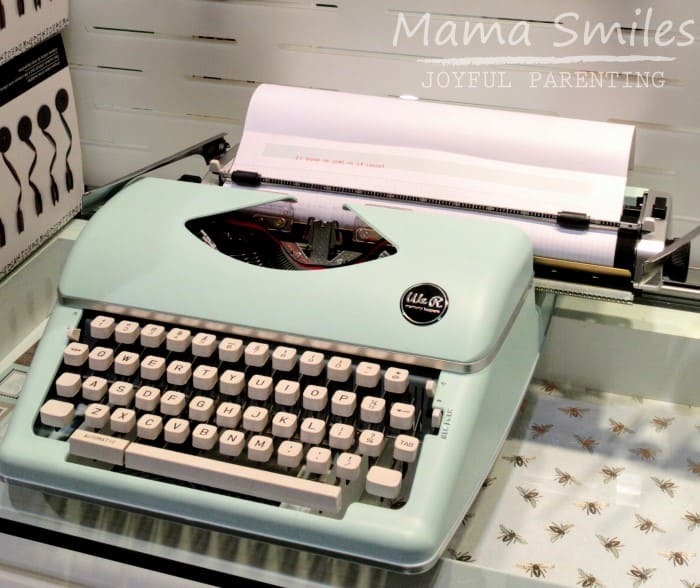 Would you use a typewriter? It’s definitely a way to write distraction-free, but I think I want one that will do a USB backup of whatever I write. Craft-tastic kits caught my eye. I know my tween would love to make these thread bowls, and these paper bowls are also intriguing. My seven-year-old wants to try making this bunny necklace. A lot of craft kits are very girl-centric, so I was excited to see this space-themed string art kit. They also have a nice gender-neutral tinkering kit. I kind of want to make these yarn giraffes for myself, and this fairies craft kit is darling. 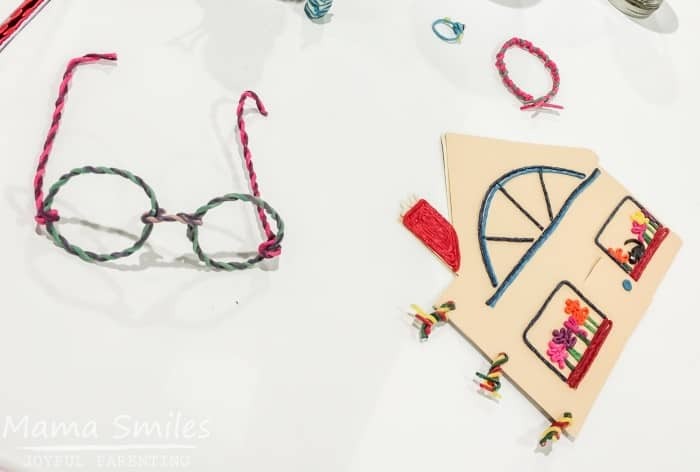 Wikki Stix are one of my favorite things to bring on plane trips with kids, so I was excited to see they have a new Wikki Stix traveler playset that was designed just for plane travel. Wikki Stix are essentially wax dipped yarn. They are easy and fun to create with, and don’t make a mess. A classic, so not a new discovery, but well worth a mention. 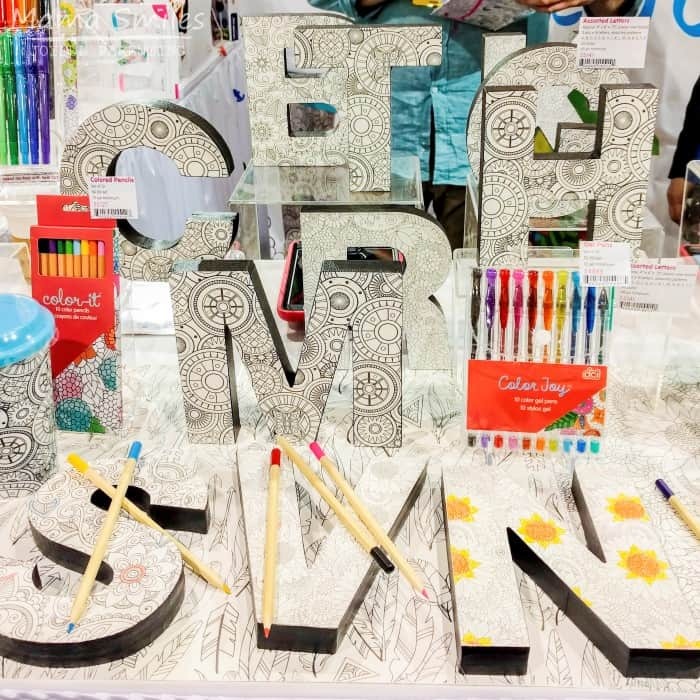 We are moving to a new house sometime later this year, and I am tempted to get these Color Joy letters for my kids to use to decorate their doors! Maybe coloring them can be something for the kids to do while I’m dealing with organizing and packing? I’m sure they will help with that to some extent, but sometimes it’s nice for kids to be busy with something else. My puzzle-loving mom recently discovered nano blocks, and she is a huge fan. The teeny tiny pieces allow for fairly detailed structures that are still tiny. I’ll admit to being tempted by this nano block grand piano. There’s a nano block violin, too! 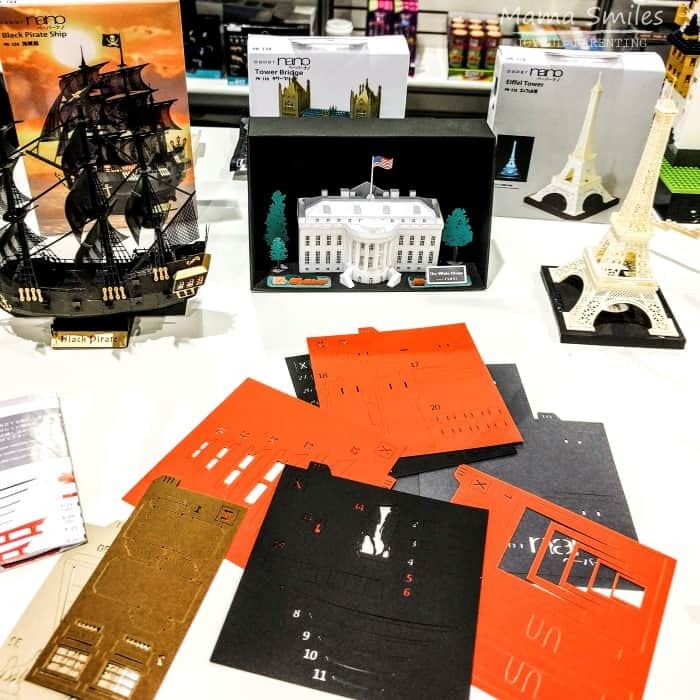 Paper nano kits bring paper crafting to an all new level. They arrive pre-cut, so you only need to worry about assembly. I always feel guilty when I throw away fabric scraps – it feels like a waste. 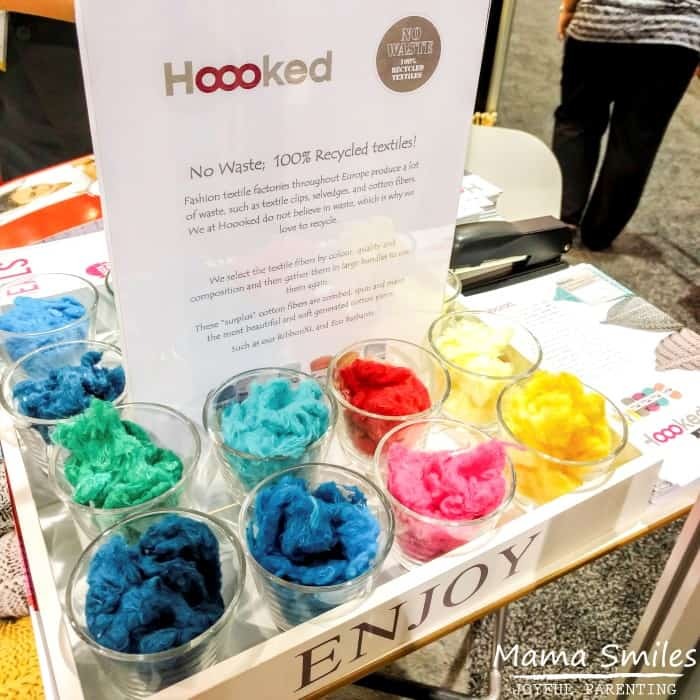 So I was thrilled to discovered hoooked, the yarn company that makes by recycling textile clips, selvedges, and cotton fibers that would otherwise be thrown away by fashion textile factories. Their yarn is not, unfortunately, widely availabe in the United States – yet. 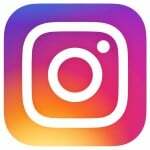 I figured they were worth a feature because their product is unique and reduces waste. I love the way knit blankets feel, but I have never really gotten the hang of knitting. 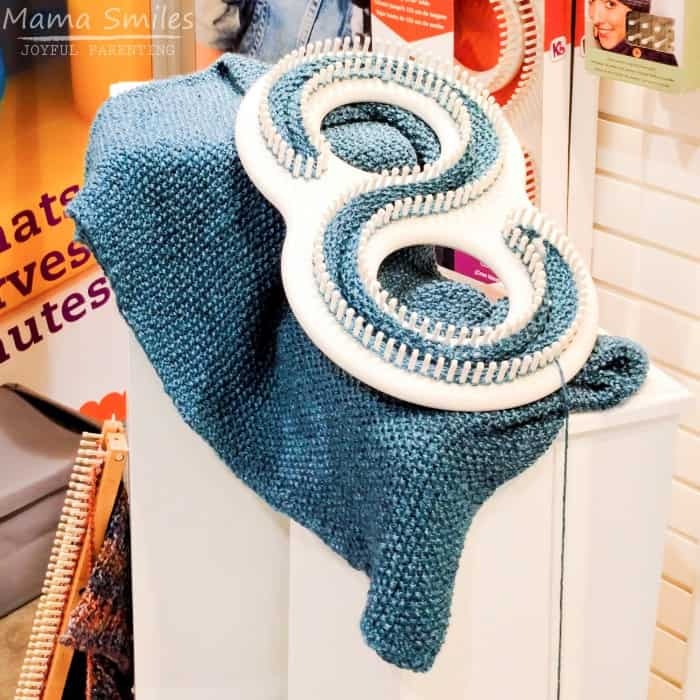 This afghan loom makes it so that even a child can knit a blanket! Different craft techniques are demoed across the showroom floor. I had no idea that this was how chevron was made! 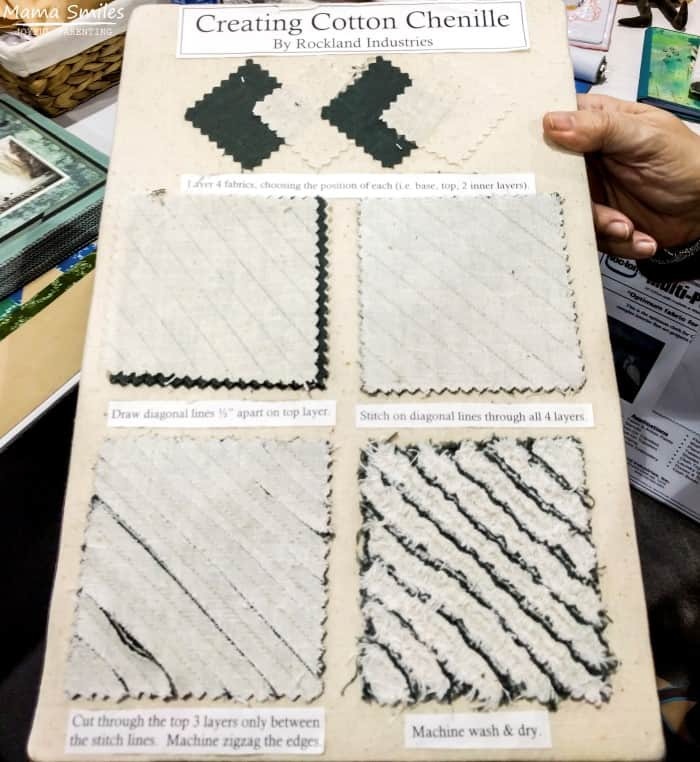 This demo board was created by Roc-lon, manufacturer of gorgeous muslins. There were a lot of needlepoint projects on display. This Starry Night cross stitch caught my eye. I have a sister who weaves on a full-size loom. She makes beautiful fabric! I don’t see myself getting one of those, but I have always been intrigued by lap looms. The book Inventive Weaving on a Little Loom opens up creative possibilities that I never would have thought possible on a small loom. Small innovations like this needle puller can make crafting a lot more fun! This rotary cutter has a more ergonomic design than most. The accompanying True Cut Ruler is designed to keep rotary cutters on track. If you invest in the best craft supplies, you’ll want to them organized. 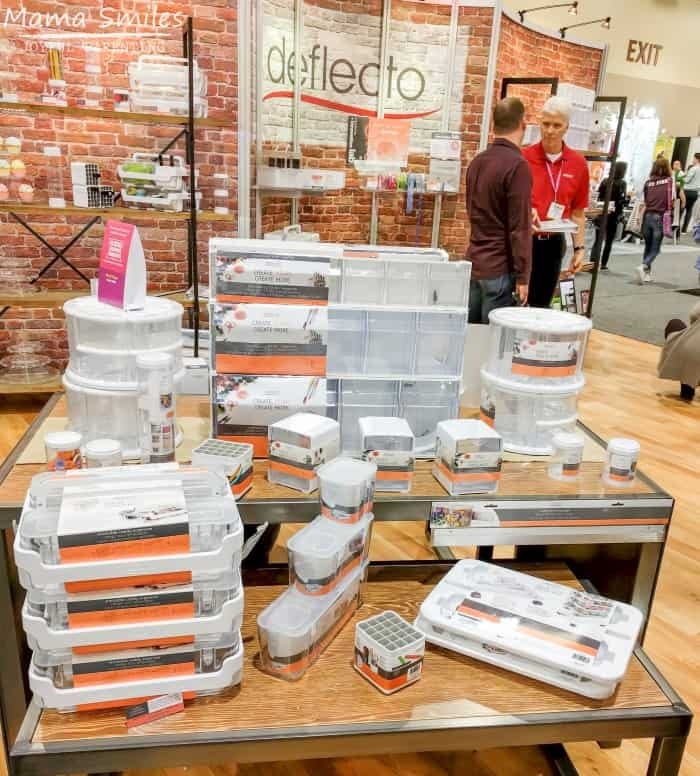 I love well-designed organization, and the Deflecto line is beautiful. They had a contest going where you had to fill the three caddies on the bottom left with a pre-selected assortment of craft supplies. The person with the fastest time won the set of caddies. I did it in under one minute, but that wasn’t fast enough to win! I’ve been watching the prices on these around the internet, and so far Target seems to have the best consistent deal. I always have post-it notes stuck around my desk (currently there is one with a chocolate milk recipe I need to blog). 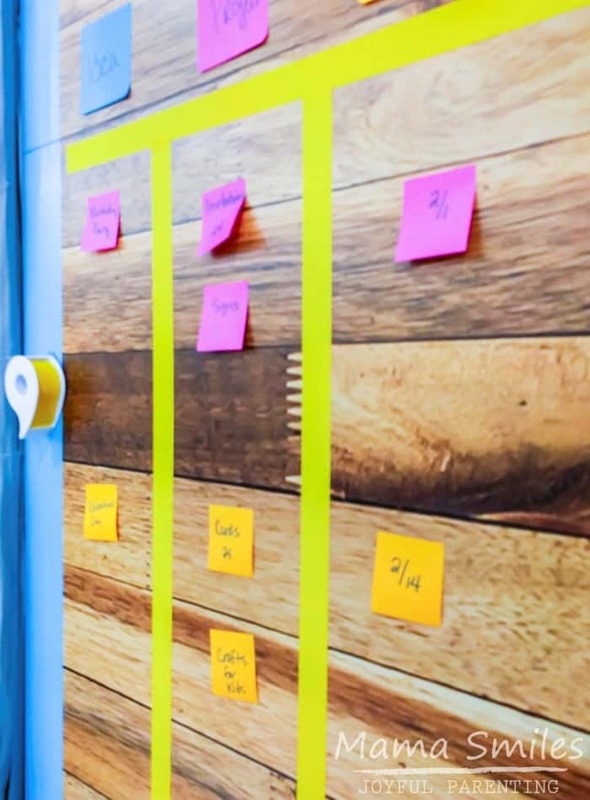 I was intrigued by the way Post-it combined their classic notes with this full adhesive roll to create a calendar or other planning space with movable parts. 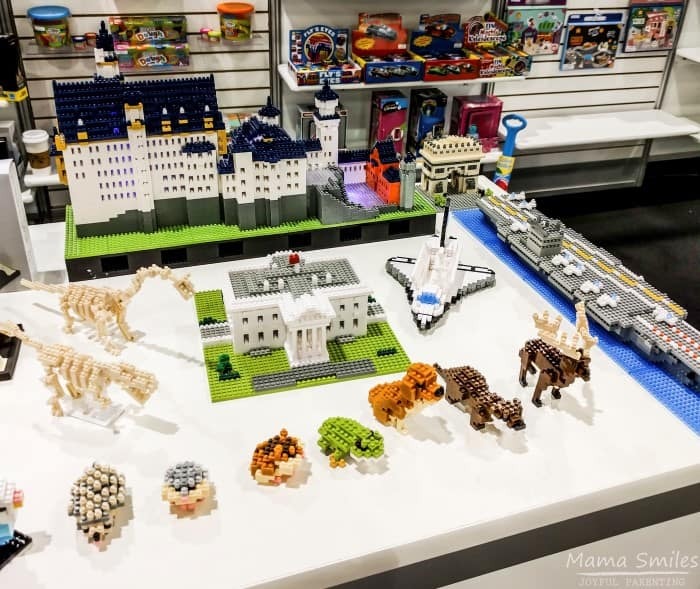 Most of the shops featured crafting materials, but Blue Moose Sweet Shoppe featured a finished project. 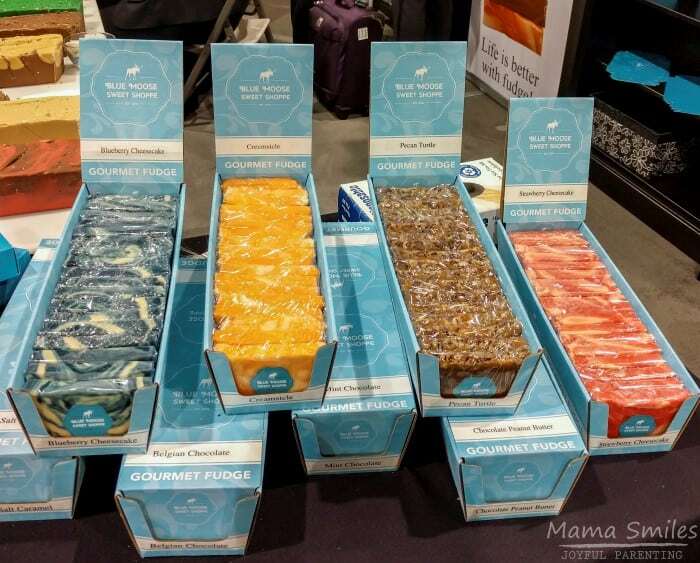 I rarely eat sweets if they aren’t chocolate, but I surprised myself by liking their cheesecake fudge samples better than the chocolate ones. And the chocolate samples were delicious. Which of these products would you put on your list of the best craft supplies? Do you have favorites that you don’t see here? Let me know in the comments. 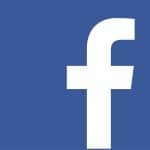 You can share photos as well as suggestions and ideas on my Facebook page, or tag me on Instagram. What a fun convention to browse through! I liked all the things you chose to highlight. The afghan loom looks especially nice on what is an unseasonably cold day here in Perth. That show looks fun! What great kits!! I would so go broke there. I’d have to make sure to leave all but a few dollars at home…….